These chain connecting links--commonly known as "missing links"--are very popular because they offer nearly seamless chain repair. Just join the two sides together then peen the rivets, and just like that, you've repaired a broken leg of chain. 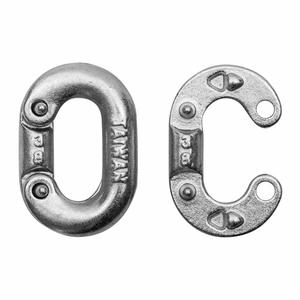 These links are suitable for use with low-grade chains used on the farm or around the house, but should not be used with Grade 70 or any lifting-grade chains. Drop forged with a zinc-plated finish for resistance to corrosion.